The New moon in Scorpio highlights 471143 Dziewanna, the latest named trans-Neptunian object. 471143 Dziewanna is very likely a dwarf planet. It is a scattered disc object discovered in 2010 during the Polish OGLE project of Warsaw University. Venus stationed retrograde in close conjunction with 471143 Dziewanna on Oct. 5, 2018, at 10+ degrees of Scorpio. 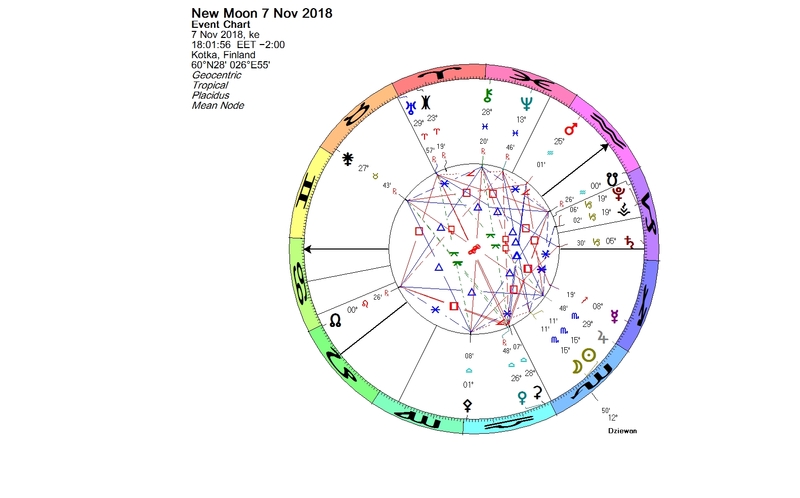 At the Libra New Moon on Oct. 9, 2018, the conjunction of Venus and Dziewanna was valid. At the moment Venus is still retrograding, and it has re-entered Libra. Today the Sun and the Moon conjoined in mid-Scorpio with Dziewanna for the New Moon. 471143 Dziewanna was named on Sept. 25, 2018, after the old Slavic goddess of the wild nature, forests and the hunt. Gold-haired, young and beautiful, she brings the spring and revitalizes the Earth. Wild yellow mullein flowers (Polish: dziewanna) are her symbol. Dried, they served as torches during her celebrations. Indira Gandhi (Nov. 19, 1917) was the first and, to date, the only female Prime Minister of India. Her Dziewanna is at her Leo ascendant opposite Uranus. Jane Fonda (Dec. 21, 1937), an American actress, writer, political activist, and fitness guru, has Dziewanna at 28+ Leo in aspect with several of her natal planets: the Sun in Sagittarius, Mars and Ceres in Aquarius, Saturn in Pisces, Chiron in Gemini and Pluto in Cancer. Christine Chubbuck (Aug. 24, 1944) was an American television news reporter who committed suicide on a live television broadcast. She has a triple conjunction of the Sun, Ceres and Dziewanna in early Virgo. Sauli Niinistö, the President of Finland (Aug. 24, 1948), has the Sun-Dziewanna conjunction in early Virgo square to Pallas in Gemini. Madonna, the “Queen of Pop” (Aug. 16, 1958), who frequently has reinvented both her music and image while maintaining autonomy within the recording industry, has Dziewanna at her Virgo ascendant in conjunction with Mercury. Michael Jackson, the “King of Pop” (Aug. 29, 1958), has a triple conjunction of the Sun, Juno and Dziewanna in Virgo. Diana, Princess of Wales (July 1, 1961), the namesake of Goddess Dziewanna, has her Cancer Sun in sextile to Dziewanna in Virgo. Dziewanna is at the midpoint of the Sun and Neptune. This entry was posted on Wednesday, November 7th, 2018 at 9:32 pm	and is filed under New Moon. You can follow any responses to this entry through the RSS 2.0 feed. You can leave a response, or trackback from your own site.